Admission: Adults-$4; Seniors/AAA-$3.50; Military-$3; Students-$1; Age 6 & under-Free. Group rates available. The Wamego Historical Society was organized in 1973. 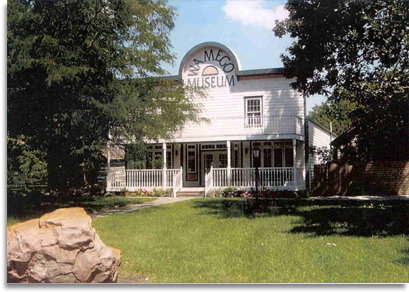 The museum and the Prairie Town Village are located in Wamego's beautiful 20 acre city park. In 1973 the first museum opened in the old Union Pacific Railroad stone workshed that was built in 1866. The Prairie Town Village started in the 1980's. In the early 1990's the Historical Society built the current museum which is a replica of Wamego's first city building. The Dutch Mill is a credit to the town of Wamego. The century-old Mill has become a familiar Kansas Landmark, not only for its beauty, but also for its great heritage. The heritage dates back to 1879 when a young Holland immigrant turned his attention to how the farmers in Kansas were still grinding wheat and corn by hand. With this in mind, John Schonoff built a sturdy windmill on his farm twelve miles north of Wamego. The Wamego Historical Society has three fundraising events each year. Young and old come to enjoy the homemade ice cream at all three events. OztoberFest also includes German made Kraut/brats and potato salad, and also beans, chips, cookies and brownies. All items for sale at 519 1/2 Lincoln (Masonic Hall) from 11am - 5pm on Saturday & noon - 5pm on Sunday. Come join us. These events draw large crowds to the community. Read more about these events and enjoy pictures of the water-cooled JD engine that cranks the 5-gallon freezers of ice cream. © Copyright 2010 Wamego Historical Society & Museum~ All Rights Reserved.